Like lots of folks with critters, when late summer / early fall arrives I start trying to figure out how much hay I’ll need for the upcoming fall / winter / spring. There are a few factors, including the number of sheep, their size, how long your grazing season is, pregnancy, how much is left from last year, and more. I’ve open sourced the spreadsheet I use in case it helps someone else. Just remember to update the assumptions for your own flock’s needs. This past weekend we put our chickens into their new mobile coop, and found them a nice space in our garden area for them to prepare. It’s a bit of an experiment, but I think it will work. Here in Wisconsin the weather is still pretty cold in March and April, and our average last frost date in my area is the 1st week of May. So what are the chickens doing? Chicken things! Scratching, digging, pooping, and spreading anything that’s put in their reach. Here they are on day 1. By the time we are ready to plant, this area will have the vegetation removed, be organically fertilized, and will have a nice layer of mulch spread out, all via chicken power. No tillers, no backbreaking work with a shovel. Just chickens doing what they like best anyway. I’ll update with a photo each week as this area is transformed into a nice area for a garden to be planted. We tried our first chicken tractor last year and it worked out well enough but it really was only big enough for 10 birds or so. It started out as a straight tractor, but as the season moved on and the birds got bigger we ended up just using it as a mobile coop. You can see it below, surrounded by premier1 poultry netting. So this year I’m trying a new design, based on the one created by Justin Rhodes at Abundent Permaculture. You can find his build instructions here. Here it is, all put together and ready for its maiden voyage! The birds will move in this weekend, and we’ll put them to work fertilizing and preparing the garden right away. Building a… hmm, what’s it called? I’ve been quiet lately. We’ve been busy with work, kids, new puppy, and building a…. not sure what to call it. People around us, at work for example, say it’s a farm. But don’t you have to plan to sell food if you’re a farm? For a while, I toyed with the word ‘homestead’, but that’s not it either. Homesteads are pretty serious. Ultimately, I think we’re just having fun growing our some of our own food and doing something that feels incredibly wholesome. It started last summer when we got a few chicks. Caring for them was so easy and so satisfying, especially when that first egg arrived in January. By February/March we were getting more eggs than we could handle, so we started giving them to neighbors and coworkers. It’s fun to share, and worth much more as goodwill gestures than $3-$4 a dozen = $12-$16 a week. Then we got the itch to start a garden, and it’s amazing. We’ve made lots of mistakes, but you have to start and every mistake is an opportunity to learn. Every meal now has something we’ve grown ourselves, especially kale and lettuce but also some peas and carrots. And the tomatoes are coming, and the jalapenos, habaneros, onions, garlic, brussel sprouts. And maybe even a few raspberries and blueberries. In April we received our first batch of meat chickens – we ordered 15 birds from Murray McMurray hatchery. We received 16 Red Rangers and one other rare chick that the hatchery throws in. One needed to be culled after she got hurt and couldn’t walk, but the others are doing great. We’ll be processing them in late July at 12-13 weeks of age. I’m not looking forward to it, but we feel that we should process them ourselves. Along the way, I’ve started to become super interested in all the plants growing out in our pasture. At first I just saw grass and weeds, but I’m started to appreciate better what they are. Weeds are nature’s way of repairing damaged soil, and we’ll see if we can help out with some carefully managed gazing and manure additions. So… what do you call that? I think I’m just a guy that likes learning and doing things himself. I’d like to know how you wired up everything (the pi to the relayboard) using 2 GPIO pins. Could you please take a picture and upload it to your blog? Good question, Jake. Here’s a picture. But that’s not too clear, let’s break it down. This gray band connects the RPi to the breadboard to make it easy to make multiple connections. But you can connect directly from the pins to the breadboard; just make sure you bring power and ground as well. And you’ll beed male/female connecting wires to make the connection. Connect the 5v power (red wire above) and ground (black wire above) to the power/gnd pins on the relay. The breadboard lets us connect multiple wires to a single pin. When that pin is ‘on’ all three connected wires are signaled. In the picture above, the 3 green wires on one pin; the 3 blue wires are connected to a second pin. The green and blue wires are connected to the relays in alternating pairs. Each one turns on one relay when signaled, so each time the pin on the RPi is on it triggers 3 relays in my case (one for each actuator in my desk). For each of my actuators I use two relays. This allows the signal to be reversed by flipping which switch is on, thereby telling the actuator to extend or contract. So, after all this, the code to extend, retract, and stop is easy! My usual workspace is in the garage, because I love having the door open to hear the birds and make as big of a mess as I need. However, we live in Wisconsin and the winters a bit cold. And our garage isn’t heated. 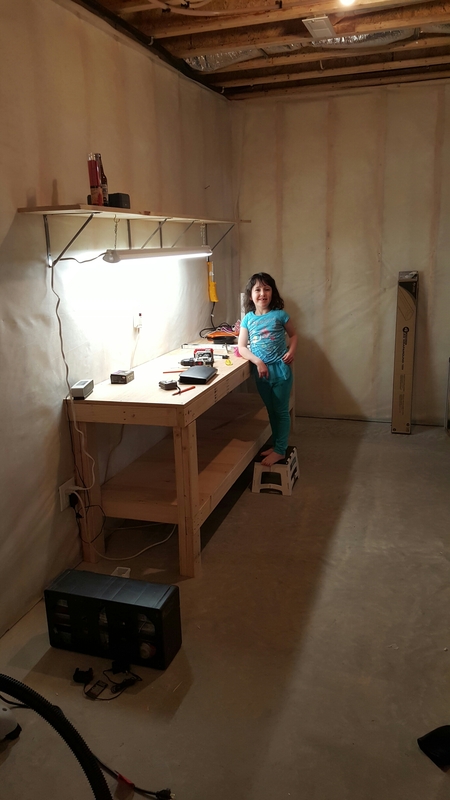 So, natural solution – make a space in the basement! That should do the trick until spring. Some of my fondest memories of childhood in Maine are of playing hockey in the backyard rink with my dad and brother. Naturally I needed to make one for my own kids. I could make it out of boards of all the same length. I didn’t want to be messing around with cutting or different lengths. All I needed to buy for lumber was 16 8′ 2×12 boards – easy. I’m really glad I went with 2×12 instead of something smaller. It turns out that my spot isn’t nearly as flat as it looked to the naked eye and our deep end is almost to the top of those 2x12s! 12 is how many you need (the joints on the straight sides) but I got an extra one because who needs an extra trip to Home Depot if they break one? I actually bought 6 wooden 24″ 2×2 stakes and about 14 24″ rebar lengths. Backyard rink tarp. There are lots of these you can buy online, we got ours from Amazon. Make sure you get one that has plenty of extra material, you don’t want to lay everything out and not have enough. Ours is 50’x 30′. Pick a starting corner and measure it out so that you have the corners marked. Measure the diagonals to make sure it is square (if the length of the diagonals are the same, your rink is square). Adjust until square. If you are off a little bit, not a big deal – it’s a backyard rink! Here is ours with the corners marked out. I also marked the midpoints on the 40′ lengths. If you used all 8′ lengths like me, this is super easy. I started in one corner and connected the two pieces together. This made it balance on its own without me having to hold it up. I then continued around the whole thing. Also note that somewhere in there I cleared out the rest of the snow from inside the rink. Put them in to make it nice and sturdy. I put most of mine close to the joints to keep those from moving too much. To lay out my tarp I basically placed it in the center and started unfolding. The thing I wanted to stay away from the most was dragging it around. There were too many sharp things like boards, rebar, etc that would tear holes in the tarp if I did that, and then it would leak when I started filling it up. As it turned out I did end up with one small hole but it was slow enough that it wasn’t a big deal. Once I had the tarp in place I put heavy stuff such as some extra lumber and around the edges and then covered the outside with snow. This was to keep it in place and prevent the wind from getting underneath and whipping it around. Also note that most websites about building backyard rinks say to wait until you are ready to fill it up before laying out the tarp, and also to avoid windy days if possible. It’ll take a few days for you to have enough ice, depending on how cold it is. In the picture above you can see the ice is a little rough. After this picture was taken I started bringing out 5 gallon buckets of nice hot water from inside the house and tossing that on and it made the ice really nice and smooth. About 5-6 trips coats the whole surface so it doesn’t take too long to do.